How Long Is Each Moon Phase? Moon phases represent the names given to points in its orbit around Earth. Each phase lasts for only an instant as the moon constantly moves. To the naked eye, the full moon lasts about three days, but in reality, it is a full moon for just an instant before it begins to wane. 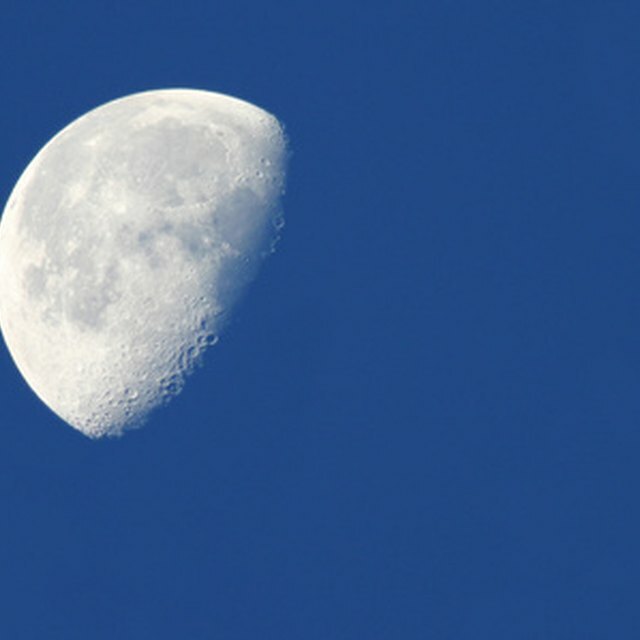 The moon takes just under one month -- an average of 29 1/2 days -- to complete its phases. As the moon passes gradually and continually through its monthly cycle, each phase lasts only an instant. The Full Moon, for example, is simply a point halfway between waxing gibbous and waning gibbous. The moon has eight phases: new moon, waxing crescent, first quarter, waxing gibbous, full moon, waning gibbous, last quarter and waning crescent. But it is not as simple as dividing 29 1/2 by eight to find out how long each phase lasts. The fraction by which the moon is illuminated steadily increases or decreases at all times. The primary phases of the Moon cycle are the new moon, the first quarter, the full moon and the last quarter. The dates and times of these phrases -- which you can calculate or find on calendars -- change from month to month according to the positions of the Sun and the Moon. Astronomers refer to the crescent and gibbous phases as intermediate phases. The phases of the Moon are connected to the position of the Moon in relation to the Sun. While the new moon is dictated by the close proximity of the Sun to the Moon, the full moon occurs when they are at opposite positions in the sky. The first and last quarters happen when the Moon has traveled one-and three-quarters way around its orbit. As the phase cycles of the Moon are almost always shorter than a full calendar month, the phase of moon that occurs at the start of the month usually occurs again before the end of the month. As a result, every 2.7 years, the full moon phase occurs twice in the same month. The colloquial term for this phenomenon is the "Blue Moon." Although 2.7 years can hardly be considered an irregular occurrence, this is where the phrase "Once in a blue moon" -- meaning something that happens extremely rarely -- originates. The Islamic culture marks the beginning of the month by the first appearance of the waxing crescent moon. In some cultures, it is a taboo to see the new moon through glass. NASA'S The Space Place: How Long Does Each Phase of the Moon Last? D, Rachel. "How Long Is Each Moon Phase?" Sciencing, https://sciencing.com/long-moon-phase-8770391.html. 21 April 2018.